Thailand Colorful Street Life Tour, Thailand Street Life Tours, Trip to thailand street. Silom is the major business district of Bangkok, where visitors can see office workers taking their lunch break in the streets. Numerous street food stalls, food courts, restaurants and small markets serve these office workers. Surawong, Chareon Krung and Mahesak, located near each other in the Silom area, are the centres of the silver and gem worlds. As the sun sets down, Silom transforms itself into a lively shopping street and entertainment venue. 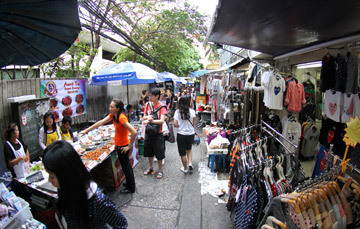 Pratunum is an open-air market consisting of many narrow walking lanes, offering a wide variety of clothing, accessories, and shoes. Pratunam is where shoppers can get lost in time while enjoying a shopping spree for fashionable products at reasonable prices. Bargaining is acceptable but, if buying in bulk, you will get the wholesale price which is already very cheap. Sukhumvit affirms to be the longest road in Thailand with many adjoining ‘sois’(small streets). It serves as the main commercial street of Bangkok and has a variety of social entertainment venues, being one of the most energetic and eclectic places at both day and night. Along both sides of Sukhumvit are department stores, Thai and international restaurants, coffee shops, hotels, galleries, parks, entertainment complexes, and nightclubs, as well as streets stalls. Amongst the most popular sois in Sukhumvit is Thonglor, where visitors can find cool and chic restaurants, stores, and nightclubs. The wide range of entertainment and retail facilities coupled with the easily-accessible location make Sukhumvit the most popular expatriate place in Bangkok. Ratchaprasong area is famous as the one of the liveliest and busy areas in Bangkok. 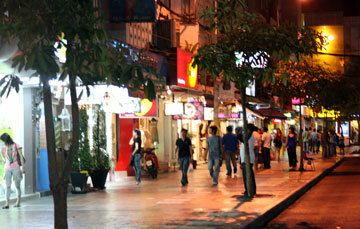 It is full of department stores, restaurants, coffee shops, hotels, and sidewalk vendors, as well as six Hindu shrines. Located not far from Ratchaprasong intersection is Siam Square, where young adults of Thailand hang out. It is an enormous shopping square full of boutiques, shops, restaurants, and department stores. Those who want to know what is in fashion in Thailand should come here and explore the stores, as well as taking a look at what the local shoppers are wearing. Concerts, fashion shows, festivals, events, and activities are often held around Ratchaprasong and Siam Square, areas. There are also many hairdressers, nail salons, and other beauty services available in these areas to pamper your every need. Bring enough cash as most of the vendors on the streets do not accept credit cards. Beware of pickpockets as these places are often crowded with both shoppers and those who take advantage of the busy activities. For roadside food stalls, choose ones where you see lots of people, as they are not only safe but you can tell that the food is delicious by the number of people in the crowd.